If you are into hunting and shooting, then the importance of selecting the best air rifle that adequately suits your purpose and budget cannot be overrated, you are bound to face challenges when choosing an air rifle because of the several different brands available on the market today. Check out our Remington Express XP Air Rifle review to see why this striking model from Remington is highly recommended. Here is a quick recap on what we think of this air rifle. Remington is a company that started manufacturing air guns in 1928 and all their air guns since then have been impressionable. Remington stopped production for a while and for its coming out in the 21st century, the Remington Express Air Rifle was invented. This introductory air rifle is of top-quality and does not fall below Remington's standards. 1. Does this air rifle have a warranty program? 2.What is very essential to shooting success? 3.Where was this product made? This rifle is an adult spring piston air gun that is consistent, easy to use and accurate. It is highly recommended for pest control, plinking, and hunting but can also be used for target shooting practice. This air rifle is among the best for pest control as it utilizes a single shot system that makes it easy to eliminate targets. It also comes with a manual that provides instructions for trouble-free use. As we proceed in this review, you would be further enlightened on the features of this air rifle that make it a high-power type that suits your needs without denting your budget. 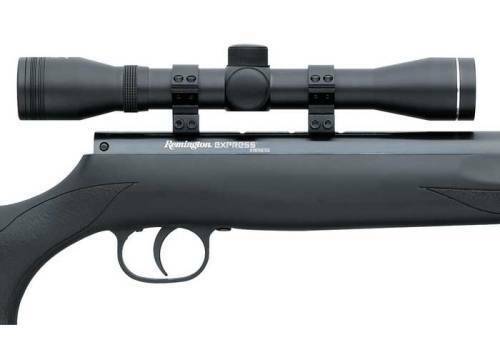 The purpose of this Remington Express XP Air Rifle review is to reduce the stress you are bound to have when choosing an air rifle. We will be talking about this rifle's features, specs, pros and cons and why it is the best for you. An air rifle is an extended gun version of an air gun that thrusts projectiles/propellants through the use of compressed air or gas. This gun is an easy buy and would impress you. It comes with an included scope and mounts for a small amount of money. These features described in this review goes further to show you that the Remington Express Air Rifle worth more than its cost. This rifle makes use of a two-stage trigger. The first stage is a kind of preparatory measure towards the next stage which is the firing stage. This enables the shooter to be steady for the discharge of the rifle which goes a long way to reduce careless shooting. The use of the right and the appropriate pellet is very important for the effective use of this rifle. Any .22 pellets can be used to operate this rifle. With the use of alloy pellets, you can fire at 1000 FPS, but this decreases to 800 FPS when using lead pellets. This rifle is sold with a 4 x 32 scope which makes it very easy to acquire targets and easily eliminate them. This rifle includes an adjustable fiber optic sight for the rear and a fixed fiber optic sight for the front. This facilitates open sights and accuracy. 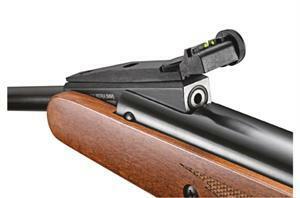 This adjustable rear sight is for elevation and windage. It utilizes a single shot system as its fire mode which vanquished targets easily. As part of your purchase package, there is a manual which includes how to maintain the rifle, how to shoot safely adequately and a comprehensive list of parts and parts diagram. This manual also includes the warranty certificate for warranty coverage. The safety system of this air rifle is automatic, and it is placed in a position where the shooter's thumb can easily disengage it. When this air rifle is cocked, its safety button protrudes from the left rear side of the air rifle, and then a shooter will have to rotate a lever clockwise to turn the safety on. This further enhances the safety of this rifle as no matter what you do the gun won't fire until the lever is turned forward to disengage the safety. This rifle has a lightweight barrel that enhances the overall pleasure of shooting with this rifle. if you are interested in other brands of air rifles, check this out! The pros and cons aspect of this Remington Express XP Air Rifle Review is to make you aware of the perks and quirks before purchase. You need to know that it is necessary that you complete and submit the warranty certificate included in the Owner's manual within 30 days of your purchase. This is because without doing this, you will not be able to access the one-year limited warranty coverage. For you to have a very high rate of shooting success with this spring piston air rifle, you need to use only high and top-quality pellets. This rifle like other Remington products was made in China. 4. How powerful Remington Express XP is? It is very powerful for hunting small games (not big games). It has a spring piston system that has the capacity of shooting lead pellets at 800 FPS and alloy pellets at 1000 FPS. 5. What is the legal disclaimer on this product? For you to purchase and use this air rifle, it is required for you to be 18 years of age and above. It cannot be shipped to New York City and its five boroughs. 6. Are eye and ear protection needed while shooting? Yes, you should always wear eyes and ears protection while shooting to enhance protection. 7. Can I re-use projectiles? No, you cannot reuse projectiles because doing so might lead to personal injury, property damage or even death. We understand that choosing a good air rifle can be a daunting task. That is why we have taken time in this Remington Express XP Air Rifle review to elaborate on the specs, features, benefits, demerits of this particular rifle for you to know how it best suits your needs. Remington Express is a spring piston air rifle that has unique features such as a two-stage trigger, fiber optic sights, a 4 x 32 scope and so many others that makes it the perfect choice for your hunting, pest control, planking and target shooting. We rate this model 4.5 stars out of the possible 5.0. I truly think this website needs much more consideration. I’ll probably be again to read much more, thanks for the info.